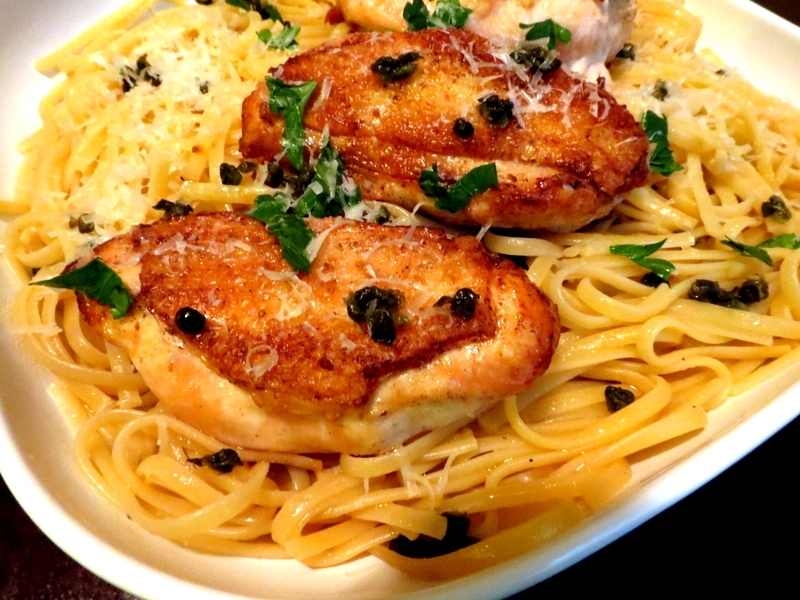 To the average American, lemon caper chicken breasts served over a bed of pasta in a white wine sauce just screams Chicken Piccata! However, it would not be fair to call this recipe as such since traditional piccata is ” sliced, coated, sautéed and served in a sauce.” For accuracy’s sake, this simple recipe comes close, but with a few adjustments and substitutions for those in a pinch. When I began prepping my kitchen to make this dish, I had no idea that it would turn out this way. I had just come home from an excruciatingly long day and my mind had run off somewhere in the far reaches of my brain. I had defrosted some skin-on boneless chicken breasts earlier in the day, but I didn’t remember what I had intended on making. As I stared at my kitchen cupboard to figure out what to whip up, a jar of capers called my name. While it would have been simple to remove the skin of the chicken, butterfly, then flatten the meat into proper piccata form, I decided to experiment with keeping the pieces whole as to create that oh-so-good crispy chicken skin. Since I was doing away with the traditional approach, I decided to mix it up with the capers as well; frying them until they burst into nutty, salty little things far less intense than their former briny selves. The fried capers provided a nice umami flavor that complimented the chicken well next to buttery pasta and a bright lemon sauce. 1. Rinse chicken breasts and pat dry with paper towel. Season liberally with salt and pepper. Allow to come to room temperature (about 20 minutes). 2. Rinse and drain capers and dry on paper towels. Heat small saute or frying pan with two tablespoons of olive oil and add dry capers until they burst and turn brown. Do not over-cook them or they can burn. Drain on paper towels and set aside. 3. Pre-heat oven to 375 degrees. Pre-heat skillet with two tablespoons of olive oil. 4. Once skillet is hot (oil is shimmering, but not quite smoking), cook chicken breasts skin-side down for 3-4 minutes over medium-high heat until golden brown. 5. Meanwhile, heat pot of water with one tablespoon of salt. Add pasta and cook until desired doneness (typically 7-10 minutes for al dente). Remove from heat. 6. When chicken skin has browned, turn chicken over and cook an additional 3 minutes. Lower heat to low-medium and set chicken aside in a dish tented with aluminum foil to keep from drying out. 7. Add additional tablespoon of olive oil, garlic, and shallots to skillet and saute until fragrant (about one minute). Deglaze skillet with white wine, scraping up the brown bits and build sauce by adding chicken stock. Cook until reduced halfway. 8. When sauce has reduced, add the juice of one lemon (making sure not to drop any seeds) and one tablespoon of unsalted butter. Remove from heat. 9. Return chicken to skillet and cover with sauce. Place skin-side up, squeeze a quarter of a lemon over chicken, and place skillet into oven for 5 minutes. 10. Meanwhile, drain pasta place on serving dish. Drizzle with olive oil, add fried capers, and toss to lightly coat. Remove skillet from oven and place chicken on top of bed of pasta with sauce. 11. Garnish with grated pecorino romano, chopped parsley, zest of half a lemon for extra brightness. *Not in the mood for pasta? Substitute the pasta for a bed of simple rice or creamy polenta to get your starch on. Reblogged this on The News Channel.